Dr. Burnett earned his undergraduate degree from Virginia Tech and received his medical degree from the Medical College of Virginia. He trained as an intern and resident at Riverside Hospital in Newport News, Virginia. Dr. Burnett served as a US Navy Medical Officer with the Southern European NATO Command in Naples, Italy for two years. He currently serves as an Associate Clinical Professor with the Department of Family Practice at East Carolina University School of Medicine in Greenville, NC. 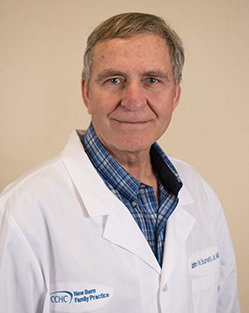 He has practiced with New Bern Family Practice since 1976. Dr. Burnett is accepting new patients.